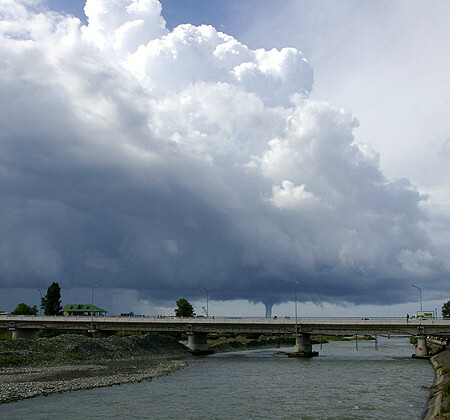 Tornadoes are actually quite common in Sochi, though are not as large as the ones destroying whole towns in USA. However, in Sochi they often cause havoc as well. 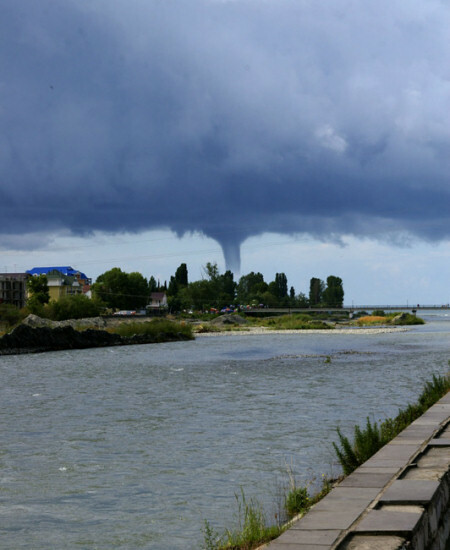 Twisters in Sochi usually form over the Black Sea during stormy weather, then coming down crushing at the city. Two years ago in August, strong tornado came in destroying residential houses (our family friend’s house was almost completely destroyed — and these are brick houses! ), part of «Youzhnye Kultury» park, and many buses on overnight bus parking, causing public transportation interruption in Adler for the next few weeks. I Found these amazing photos at 50hz.ru by Alex A. Bel. , I’ve never seen one this big over there! They have more, check ’em out. These photos are from Adler district.